This book, the whole series in fact, started from the title Wedding Favors. I wanted to write a light, funny story that included a wedding, but I had no idea who or what the tale would be about. Why not start with the basics? I’ve always enjoyed choosing titles, so I searched for a good series name. For hours I combed the thesaurus, looking for wedding related words. When I didn’t strike gold there, I jumped to online wedding supply sites and came up with Wedding Favors. The title alone gave me the overall conflict for the series. Instead of gifts the bride asks each of her bridesmaids for a favor. No way could they be easy favors, like pick up her dress or mail the invitations. They had to be epic, or at the very least diabolical, meant to start a domino effect. I won’t give away the other favors in the series, but in Bridesmaid Blues the maid-of-honor, Dani, agrees to keep the best man away from the groom until the wedding. What’s so bad about that? He’s hot and they’re both single. To ramp up the consequences, I devised the ultimate conflict. The best man is her ex-boyfriend, and bolted the second she told him she loved him. Jerk. I’ll admit, when I started plotting Bridesmaid Blues I had plans to put the hero through hell. Then I had to go and give him depth, a past, and some baggage. It became darn near impossible to torment him—too much. But he wasn’t off the hook that easily. Dani wanted a little revenge, but she ended up getting a lot more than she or I bargained for. I love how this story turned out. It has the light-hearted style I love to write and characters who were easy on me. Sometimes they fight every step of the way and I want to burn the manuscript in the middle of the room. But not this time. 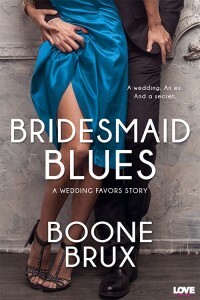 Hopefully, you’ll enjoy Bridesmaid Blues as much as I did writing it. Win a Nook eReader During the Entangled Flirt Launch Celebration!